An aviation expert says he’s confident investigators will figure out why a twin-engine plane broke apart in the air over a Southern California neighborhood. John Cox, a former accident investigator, said Monday that mid-air breakups typically leave telltale signs in the plane’s metal. National Transportation Safety Board officials are collecting parts of the plane that rained down onto suburban Yorba Linda. Cox, head of the consulting firm Safety Operating Systems, says investigators should be able to build a sequence of the breakup that will lead them back to where it originated. The pilot killed Sunday was identified as 75-year-old Antonio Pastini. Authorities are still trying to identify four people killed on the ground. Southern California authorities have identified the pilot of a small plane involved in a deadly weekend crash as a retired Chicago police officer. The Orange County Sheriff’s Department says the pilot killed Sunday was 75-year-old Antonio Pastini of Gardnerville, a northern Nevada community. Authorities are still trying to identify four people killed when part of the twin-engine Cessna fell into a house in Yorba Linda and ignited an intense fire. The condition of the bodies may require use of DNA. National Transportation Safety Board investigator Maja (MY-uh) Smith says witnesses described the aircraft coming out of a cloud and its tail and other parts breaking off as it rapidly descended. Investigators are examining wreckage and damaged homes in a Southern California neighborhood where a small plane crashed after breaking up in flight, killing the pilot and four people on the ground. The twin-engine Cessna 414A was seen coming apart Sunday afternoon over the Los Angeles suburb of Yorba Linda and falling in pieces to the ground, torching a home where four of the victims were killed. The Orange County Sheriff’s Department says victims’ identities are not yet available Monday morning. The National Transportation Safety Board has scheduled a 2 p.m. briefing about the crash. 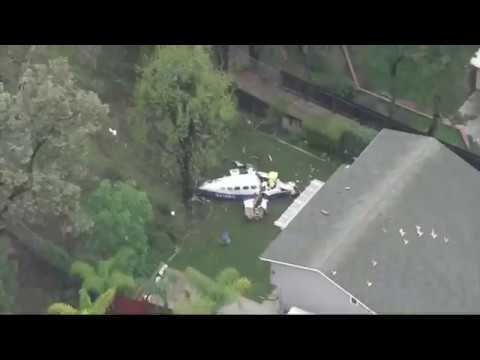 Officials say a small plane apparently broke apart over a suburban Southern California neighborhood and that four people in a house were killed after debris fell from the sky and the house burned. The pilot of the twin-engine plane also died. Debris also fell elsewhere in the neighborhood in the city of Yorba Linda Sunday afternoon. The cause of the plane’s problem is under investigation by the Federal Aviation Administration. Orange County Sheriff’s Lt. Cory Martino told reporters the occupants of the house were two males and two females, without providing additional information about them. The FAA says the 414A Cessna took off from the Fullerton Municipal Airport about 12 miles (19 kilometers) west of the neighborhood. The house was hit by the plane’s main cabin and one its engines.